How many pairs of shoes do you own? Me? I have way more than I can count on one hand, which means that I need tons of shoe storage. I can’t help my shoe obsession. Honestly, I just see a cute pair of shoes and I just have to buy them! So, I realized recently that my closet just really does not offer enough shoe storage, so I started looking for ways to increase my shoe storage space. 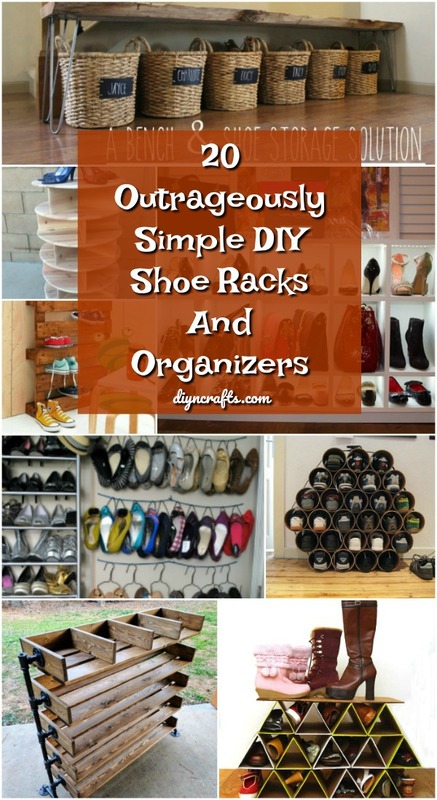 What I found are 20 outrageously simple DIY shoe racks and organizers that you can make today. All of these offer you enough space for multiple pairs of shoes. 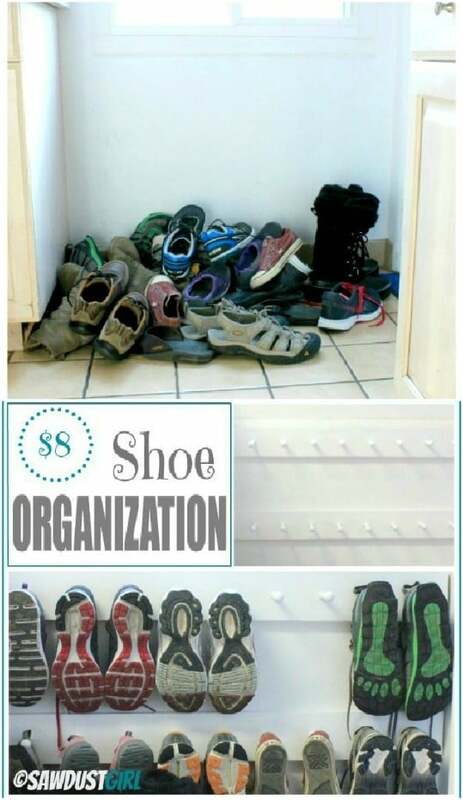 Whether you need something in the master closet for your own shoes or you want something to put in the mudroom for keeping your kids’ shoes organized and easy to find, you will find the perfect DIY shoe organizer and storage solution here. These are all super simple to make and many of them use reclaimed wood and other upcycled materials. You know how much I love my upcycling projects! And, if you’re looking for a really great post on organization, check out these 50 genius command center ideas to really get your household organized. I do love a good organizing project and these are certainly ones to consider. If you have tons of shoes like me, you really do need to create some additional organization space and these DIY shoe racks and organizers will definitely do that for you. If you’re ready to get your closet organized, you definitely want to take a look at these. And, also check out how to make a decorative hanging DIY jewelry organizer. You can get your closet and your dresser organized and do it all in just one day! I love this DIY bench that allows you to store your shoes in baskets underneath. 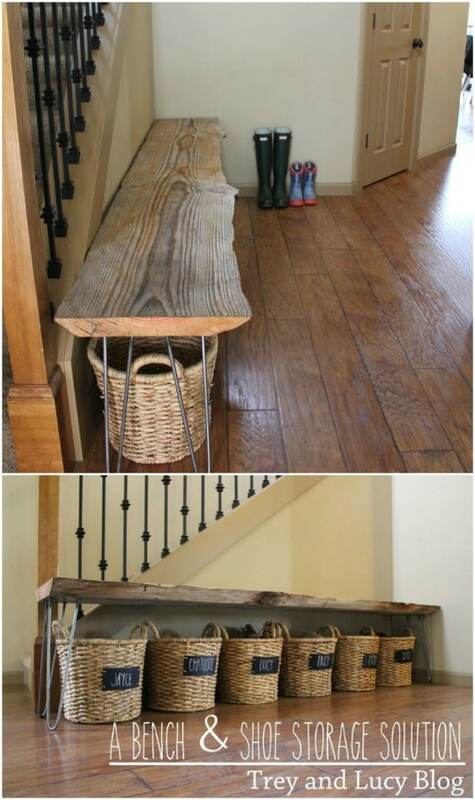 This is great for the entryway or mudroom or you could just as easily build it for a bedroom. Imagine having a window seat with shoe storage underneath! You just build the bench (and you can use reclaimed wood if you have any) and then add wicker baskets – or other storage totes of your choice – to hold your shoes. Add a DIY coat rack and you have the perfect mudroom organizer! 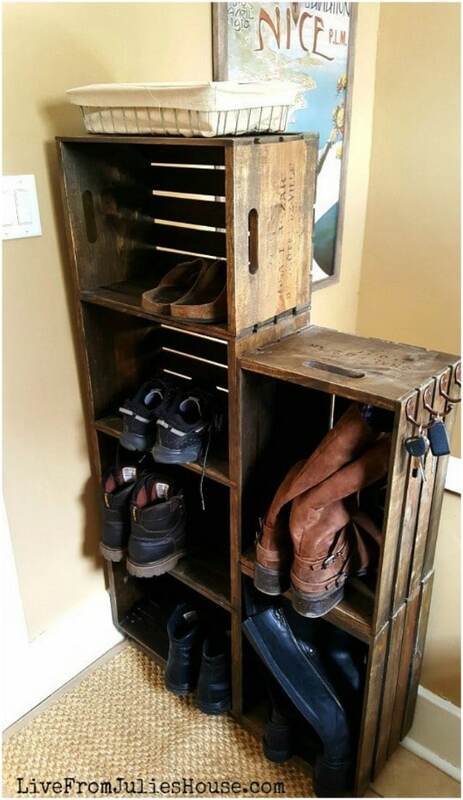 How great is this shoe organizer that you make from reclaimed wood? Not only is the wood reclaimed, you use piping to build the base. If you have the materials available from other projects, you can do this one for nothing. And, there is room for every pair of shoes you could possibly own. This would be such an easy DIY build or you can take a look at the one that I found on Etsy for less than $200. 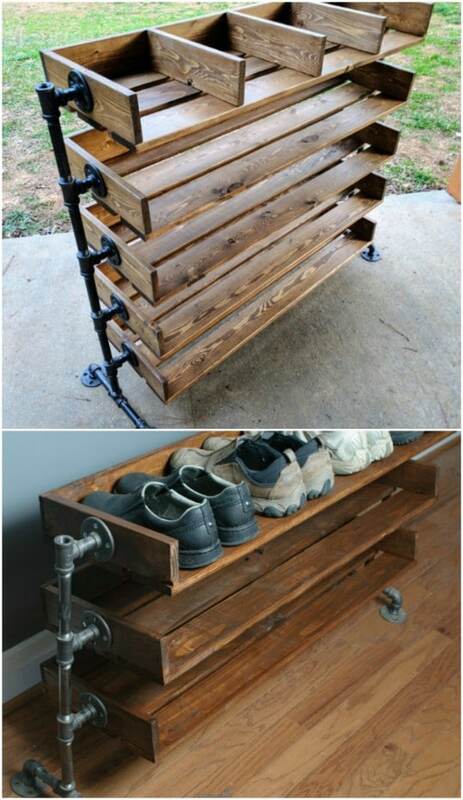 Build your own rustic looking industrial style shoe rack with some wooden boards and pipes. This builds directly into the closet or you could build it on a bedroom wall or even behind a door. It’s pretty versatile and really easy to DIY and you can make it as big as you want to hold all of your shoes. If you love the industrial décor look, this is a great DIY shoe rack to build. This shoe rack is made from crown molding, and you can do the entire thing for less than $20. If you happen to be remodeling and are redoing your molding, you can get this one built for free. 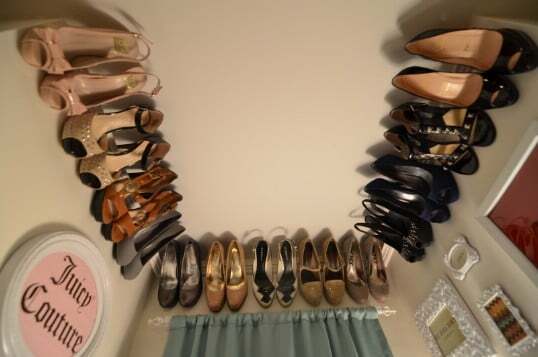 You put it close to the ceiling so it doesn’t take up any floor or wall space and if you go all of the way around your closet, you will have room for all of your shoes! Those old metal hangers that you have on hand are perfect for hanging up and organizing those flip flops and sandals. 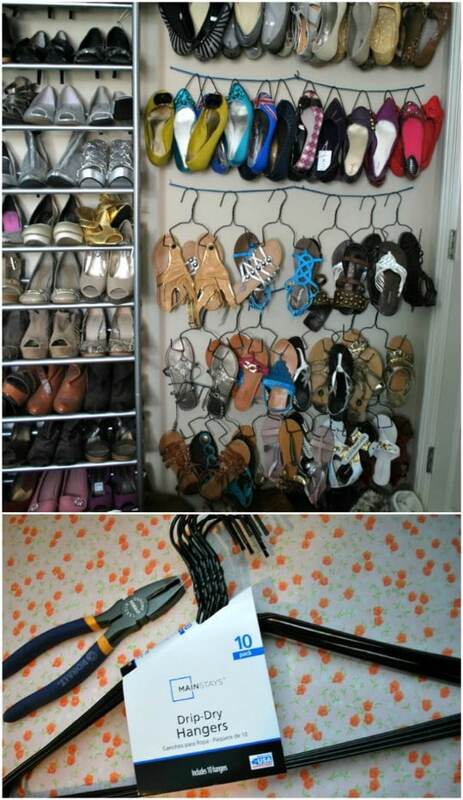 This is a great repurposing idea for metal hangers and it gives you so much room to organize those summer shoes. You need metal hangers and if you don’t have any on hand that you can use, they’re really cheap at the Dollar Store. This is the perfect storage system for your DIY flip flops and sandals! Wooden boards and pegs are great for hanging your shoes and keeping them organized. 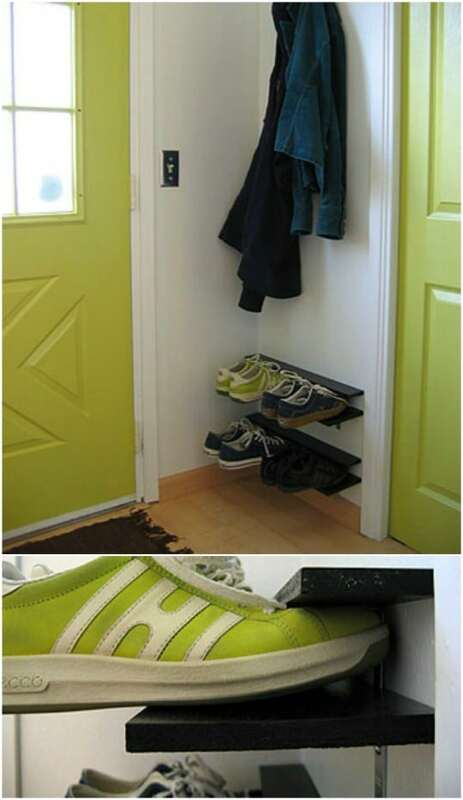 You could do this one in the closet or in the mudroom or entryway if you need a place to keep your family’s shoes. You just build the racks and then hang them wherever you need. This is a great one to hang inside closet doors for the kids – they will never have trouble finding their shoes again! Have you ever seen one of those luxurious closets with spinning shoe carousels? They’re great, aren’t they? You can get your own shoe spinner with a bit of wood and a few hours of time. These spinning shoe carousels are sure to help you to keep those shoes organized and they don’t take up much floor space since the storage goes up as opposed to out. You can build this one yourself or just grab this one on Etsy. You can make this DIY shoe rack from empty cardboard boxes – it’s cheap and easy and you can do it to hold all of your shoes. 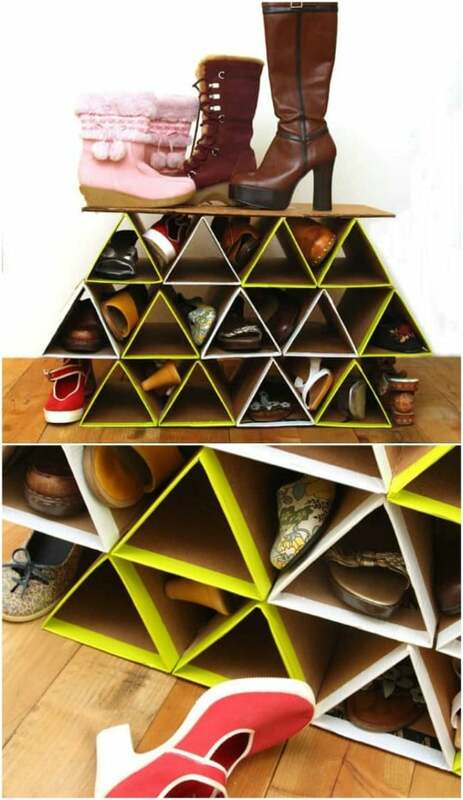 It helps to save space, too because you stack the shoe cubbies on top of each other. This is a really unique and creative look and it’s perfect for smaller closets or bedrooms. And, it’s also a great way to upcycle empty cardboard boxes. Those old empty wooden crates can be put to really good use as a DIY shoe rack. If you don’t have any wooden crates, you can build them yourself or check your local thrift stores. They often have them for just a dollar or so each. Once you have a few, you just put them together to build this amazing shoe rack that will hold all of your shoes – and do it in rustic farmhouse style. 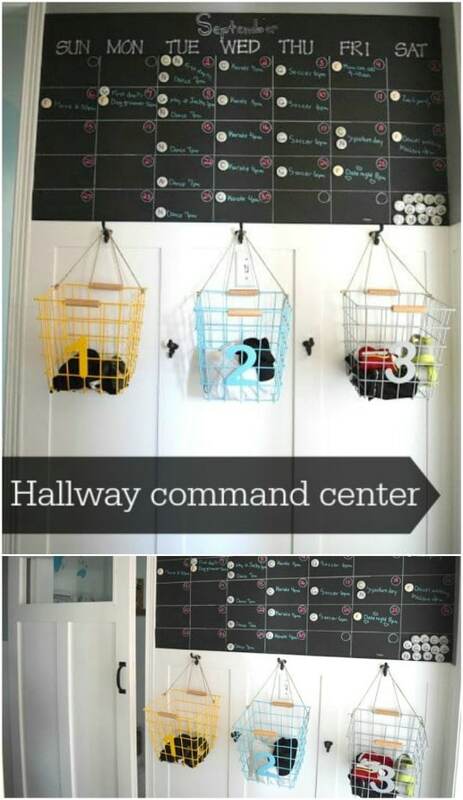 Not only is this a great idea for a DIY shoe organizer, it’s a wonderful command center, too. Command centers are a must for busy families and this one has the added bonus of hanging baskets to keep all of those shoes organized. If your kids play sports, this is a great shoe organizer to keep their sneakers and cleats separated and it works perfectly for those galoshes during the colder months, too. 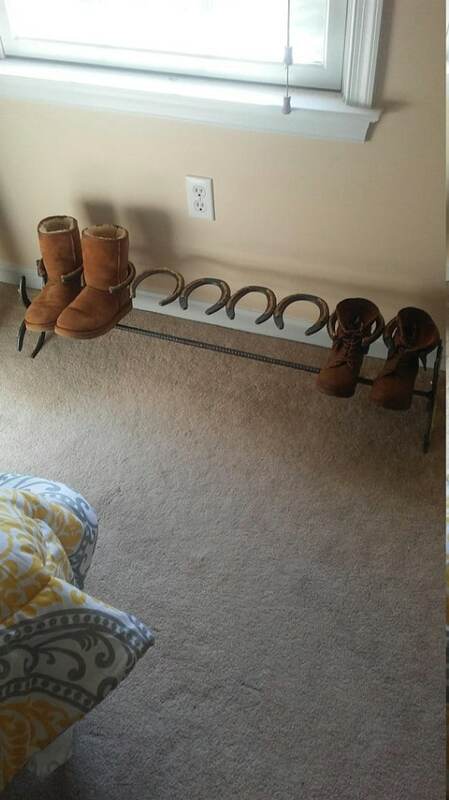 I love this idea of storing your cowboy boots on horseshoes! 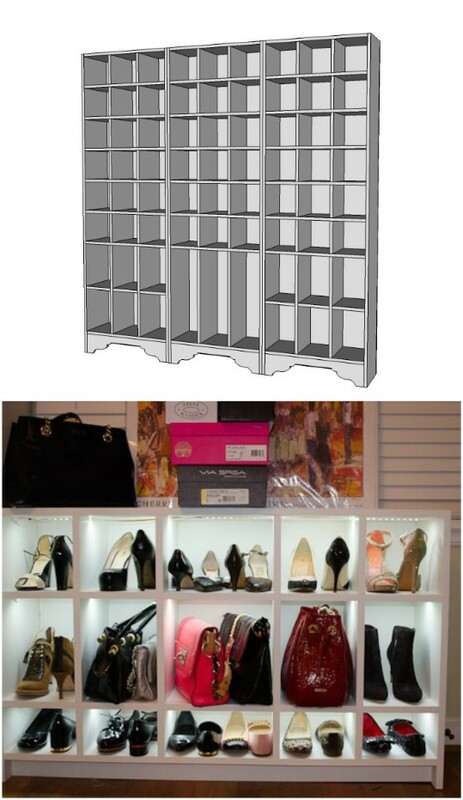 This is a wonderful shoe organizer for any type of shoes but it looks especially great with cowboy boots. The horseshoes are welded together and they hold your boots and other shoes perfectly in place. You can easily make this one yourself – although you will need to get someone to weld for you – or you can just look at this one on Etsy. You can pick it up for less than $50. 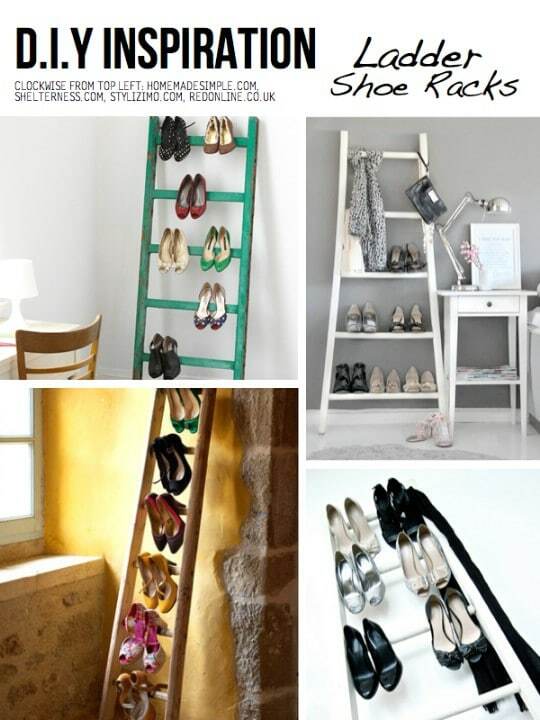 This DIY ladder shoe rack is super easy to make and is perfect for storing several pairs of shoes without taking up too much space. You can do this with an old wooden ladder if you have one or just build the ladder yourself. If you’re looking for some DIY farmhouse décor, this is a great one to build. It’s really easy and you can get so many shoes on this thing! 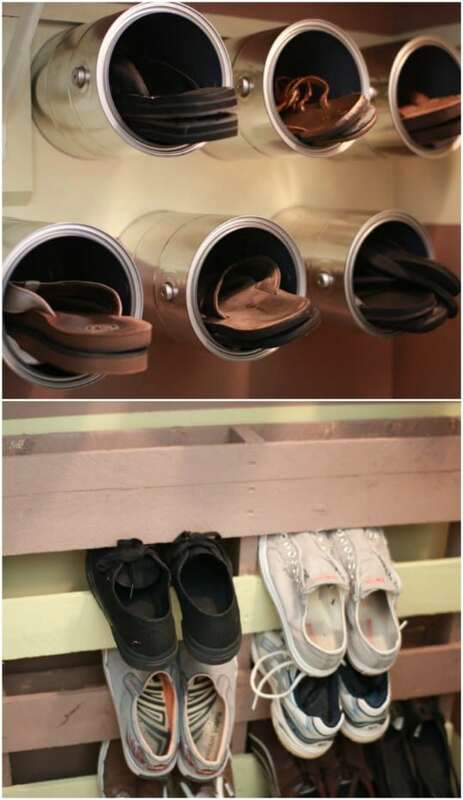 If you need a space near the front door – or back door – for shoes, these floating DIY shoe racks are great. They are really easy to build and they don’t take up a lot of space. Build as many as you need depending on the size of your family so that you have room for everyone’s shoes. Your shoes will stay perfectly in place – up off of the floor. I love this idea of taking empty paint buckets and turning them into neat little holders for your shoes. You can attach them directly on the wall and put up as many as you need to hold your shoes. You can get several pairs of flip flops or flats into one can. These would be perfect for kids’ rooms – just paint them colorful colors and hang them in the closet or even right there on their wall. 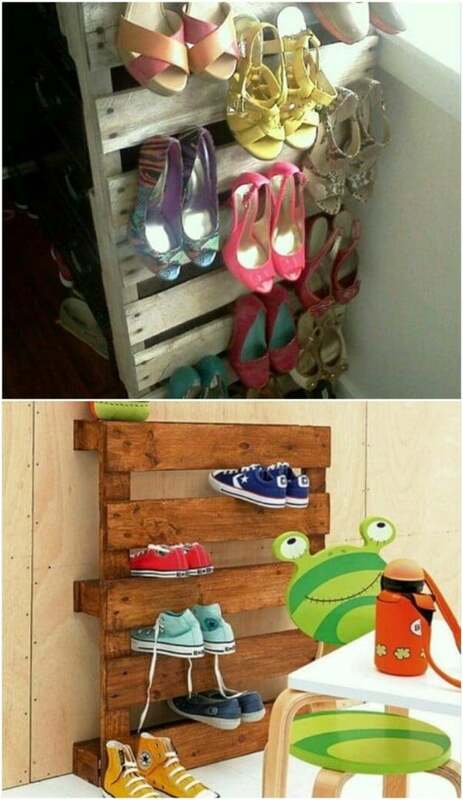 Do you know what’s great about using an old pallet as a shoe rack? You don’t have to do anything except for stand the pallet up against the wall! Your shoes will fit perfectly in between the slats and stay right there where you put them. You could hang pallets on the wall of your closet. In fact, you could cover the entire inside of your closet with DIY pallet shoe racks and have space for every pair of shoes you own. I do love DIY pallet projects for indoors and out! 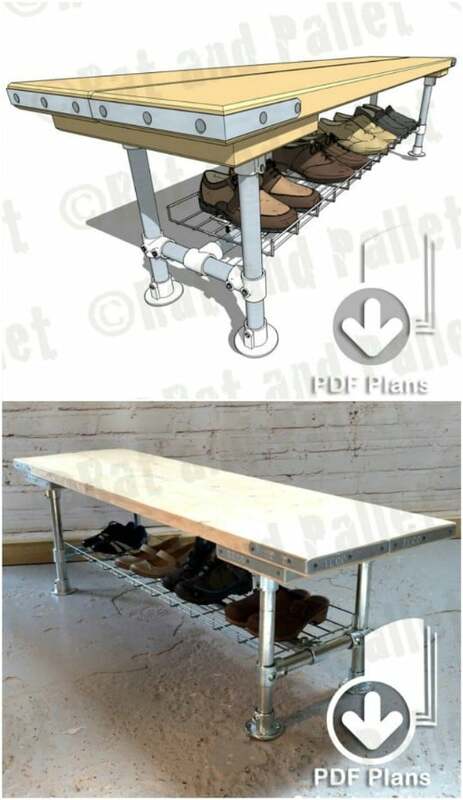 This DIY scaffold shoe bench is great. It would be perfect for a kid’s room. Not only does it have room for so many pairs of shoes, it has a great tabletop that is perfect for doing crafts or homework. You can get the plans for this one over on Etsy and they are less than $10. 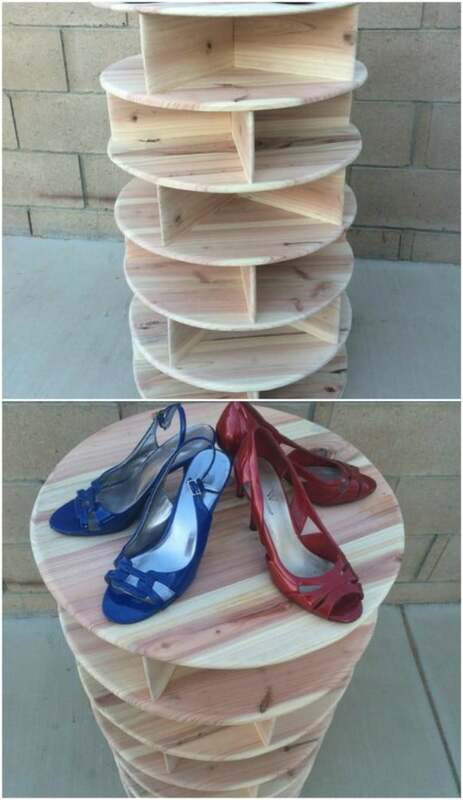 Once you have the plans, you just need some wood and other materials and you can build this shoe bench in just a few hours. 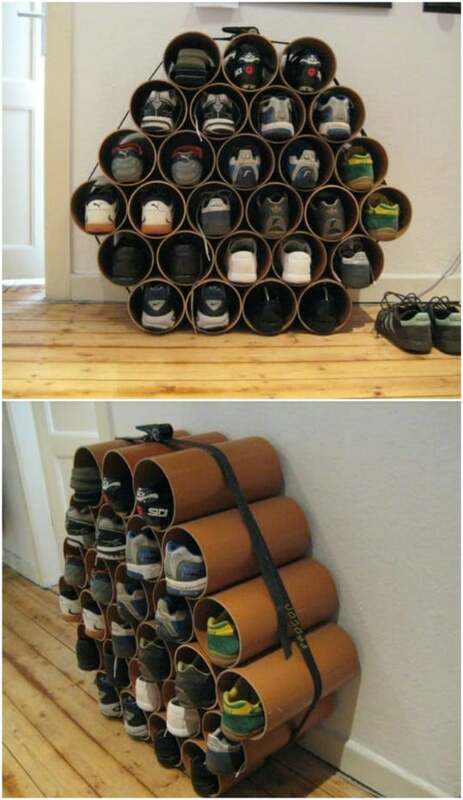 Some large PVC pipe is great for storing and organizing your shoes. 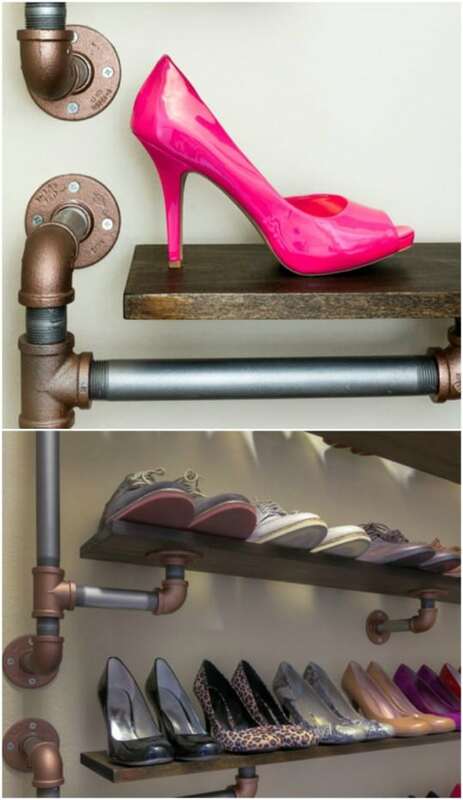 You just have to cut the pipe to size and then attach it to the wall of your closet. If you don’t really have closet space, you could also do this in the bedroom. It makes really unique décor. If you’re using them in kids’ rooms, you could paint them different colors before you hang them. Or, leave them white for a crisp, clean look in the master bedroom. You can pick up tension rods at the Dollar Store pretty cheap. Grab a few smaller ones and then when you get home, use them to make a quick and easy shoe rack for the closet. You just hang the tension rod pretty close to the wall and then use it to slip your shoes in. This works really great for those high heels. The heels will fit right between the tension rod and the wall and hold your shoes perfectly in place. This shoe rack is huge. It literally has a space for all of your shoes and then some. And, it won’t take you nearly as long to make this one as you may think. If you have a pretty big closet, this is the perfect DIY shoe rack, but you could do this one even if you don’t have a huge closet. Just build it right onto your bedroom wall. It also makes a wonderful mudroom shoe rack and really does have room for everything. 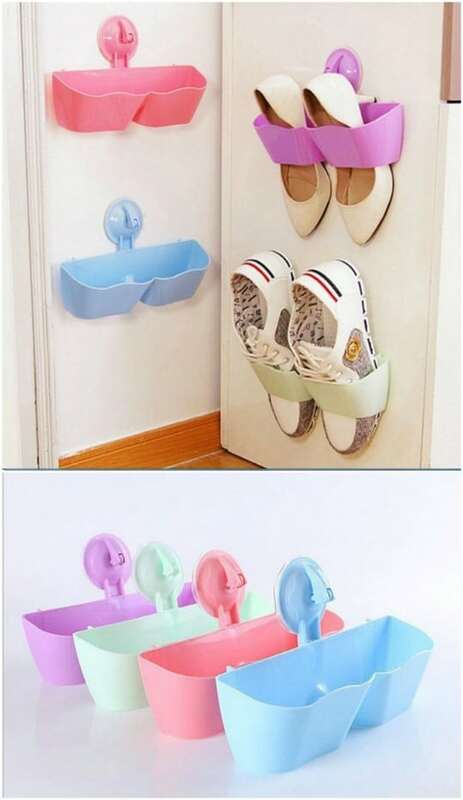 I found these great little plastic suctioned shoe holders on Etsy, although they look simple enough for you to DIY. Just use some upcycled plastic bottles, like laundry detergent bottles, to make the actual holders and attach them to some of those cheap suction hooks that you can get at the Dollar Store for around a dollar per pack. If you prefer, you can pick these up on Etsy for around $14 and you get four shoe holders in different colors. I LOVE these IDEAS!! Thank you so much for sharing them!! Have a Great & successful New Year to all who read!! AMEN.